The presence of Red Eléctrica in the Canary Islands, in addition to being a guarantee of transparency and neutrality in the functioning of the Canary Islands' electricity sector, makes the inclusion of other generators and traders possible, thus forming a Canary Islands' electricity system that is more competitive and efficient. Red Eléctrica’s carries out its activities from its main offices in Tenerife and Gran Canaria. Said activities are focused on transmission grid planning, management of access requests to the transmission grid submitted by generators and distributors, drawing up maintenance plans for generation and transmission facilities, the carrying out of economic dispatch of the generation units, and organisation of the power measurement system. Similarly it has available two control centres (Tenerife and Gran Canaria) for real-time supervision of the Canary Islands’ electricity system. Red Eléctrica has two control centres: one on Gran Canaria and the other one on Tenerife. 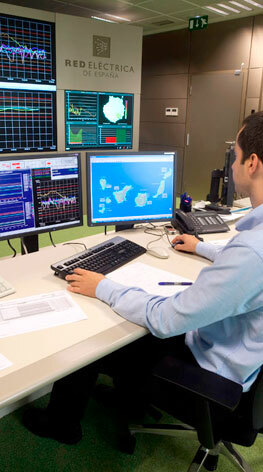 Both centres are responsible for carrying out the monitoring of the electricity system and operate as a single virtual centre that works jointly with the dispatch units of the Canary Islands’ generation and distribution facilities.Specifically, it has to carry out, amongst other things, the real-time monitoring of the electricity system, demand coverage scheduling activities, real time management of generation-demand deviations, as well as the monitoring and study of works carried out on the insular transmission grid.